In our paper , Figure 1 should be corrected as follows. MiR-647 is downregulated in gastric cancer tissues and associated with the migration and invasion of gastric cancer cells. (A) Expression of miR-647 was determined by qPCR in 109 human gastric cancer tissues, which was normalized against an endogenous U6 RNA control. ***p<0.001. (B) Relative miR-647 levels of GC and normal tissues measured by qPCR were shown using pie chart and waterfall plot. The fold change of relative miR-647 expression (T/N) >2 or <1/2 was defined as significant. For waterfall plot, the fold change of relative miR-647 expression (log2[T/N]) >1 or <-1 was defined as significant. 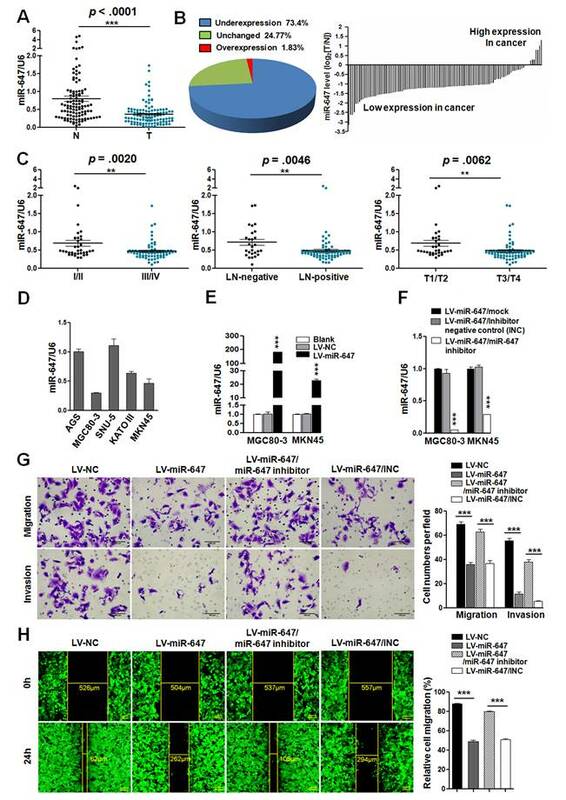 (C) The relationship between miR-647 expression and clinical stages, lymph node-metastasis or local invasion. *p<0.05; **p<0.01. (D) Expression of miR-647 in 5 normal human gastric mucosa tissues, 5 GC cell lines and 3 colorectal cancer cell lines was analyzed by qPCR. (E and F) Expression of miR-647 in transfected MGC 80-3, MKN45 and AGS cell lines were analyzed by qPCR. ***p<0.001. (G and H) The 3D migration and invasion changes of different MGC 80-3 cells were tested using transwell chamber migration assay and invasion assay. Cell 2D migration was tested using monolayer wound healing assay. ***p<0.001.